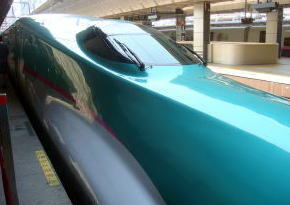 has started to run from March 2011. 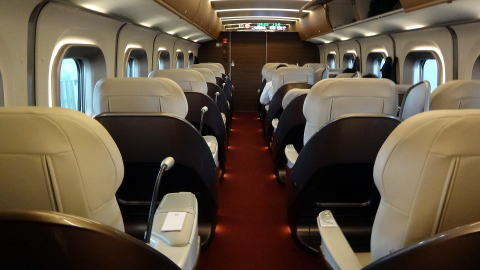 All 'Hayabusa' train vehicles do not provide a smoking booth, and entirely smoke-free. 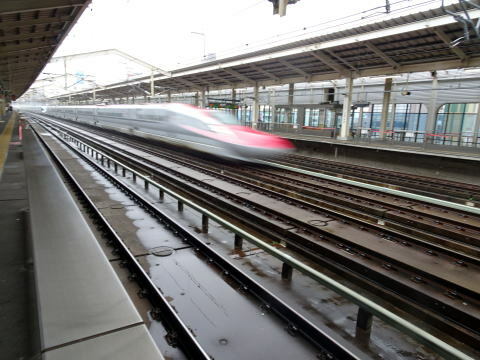 commercial rail speeds up to300km/h, linking Tokyo and Aomori in three hours and 10 minutes. 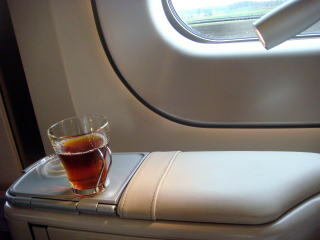 between Utsunomiya and Morioka from March 2013. 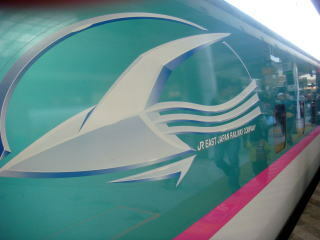 JR East plans to increase its speed to 360 kms per hour by the year of 2020.
and alcohol beverage. 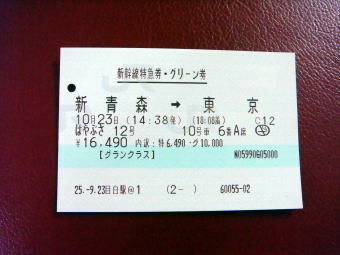 A ticket price is \26,360 ( $336 in October 2012) from Tokyo to Aomori, one way. 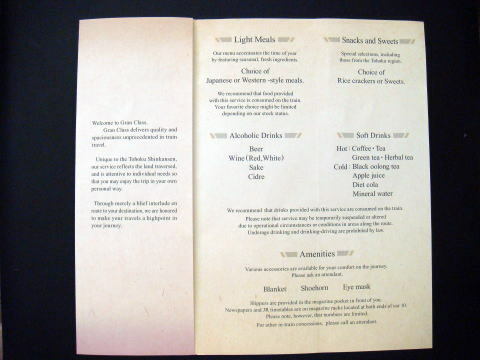 This is a menu of light meals, snacks and sweets, served at Gran-Class of Shinkansen, JR-East railway. 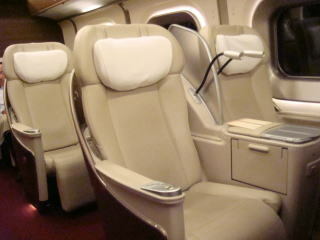 This photograph shows the First Class car seats of Tokyo-Aomori bullet train 'Hayabusa'. 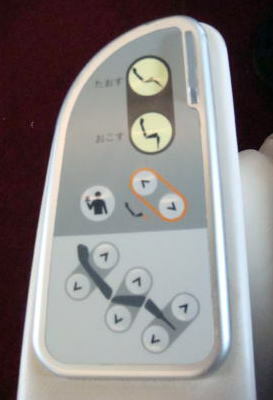 A mini-spot at a seat is light-controlled. 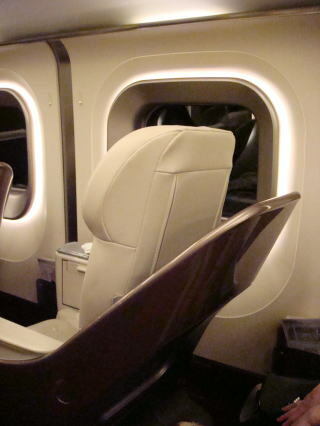 It provides eighteen, 45-degree reclining. Above photographs were taken in October 2012, by Dr. J. Miyamoto. 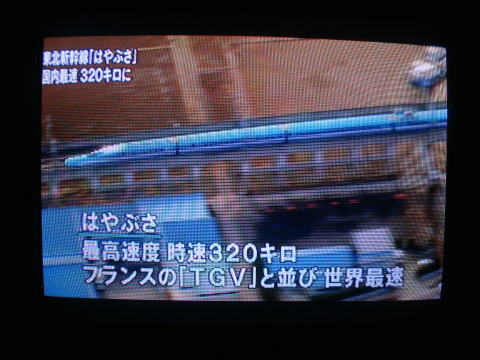 Left photo shows Shinkansen E5 railway vehicle. 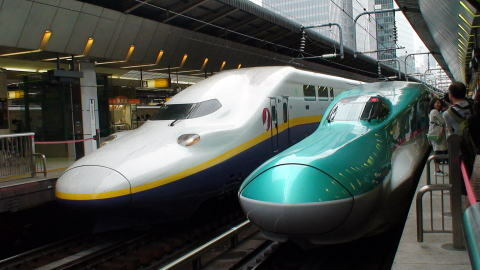 Tokyo-ShinAomori bullet train 'Hayate' is somewhat slower than 'Hayabusa'. 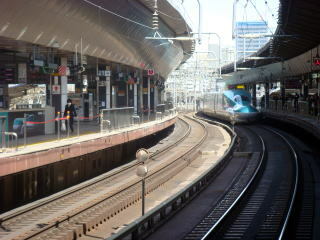 Right photo shows the Hayabusa train departing Tokyo terminal, pictured in March, 2012. 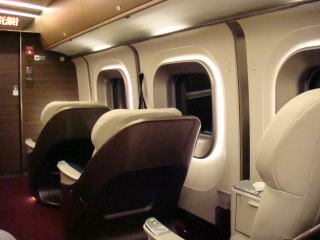 This shows interior of a super-express train, photographed in October 2012. 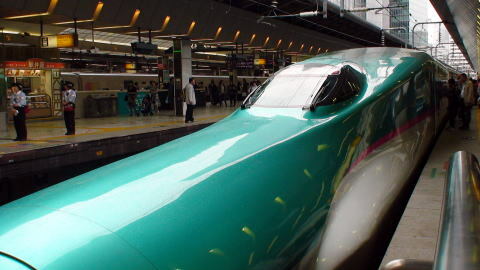 (L) The Hayabusa bullet train is waiting for a start at Shin-Aomori Station. 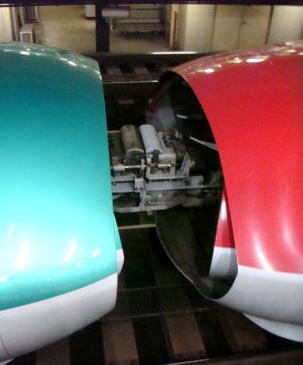 (R) This shows the joint segment of the vehicles of 'Super-Komachi' and the vehicles of 'Hayabusa'. 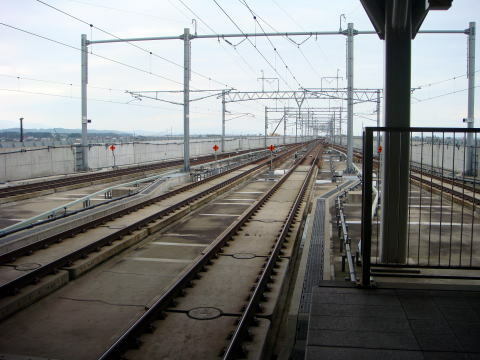 A train-vehicle connection was conducted at Morioka Station. 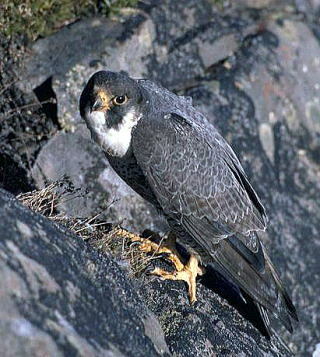 The last four photographs were taken in October 2013. 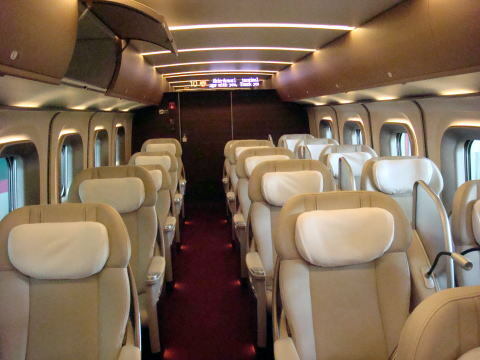 The maximum speed of Hayabusa is 320 Km/Hour, the world fastest train, the equal level of France's TGV. 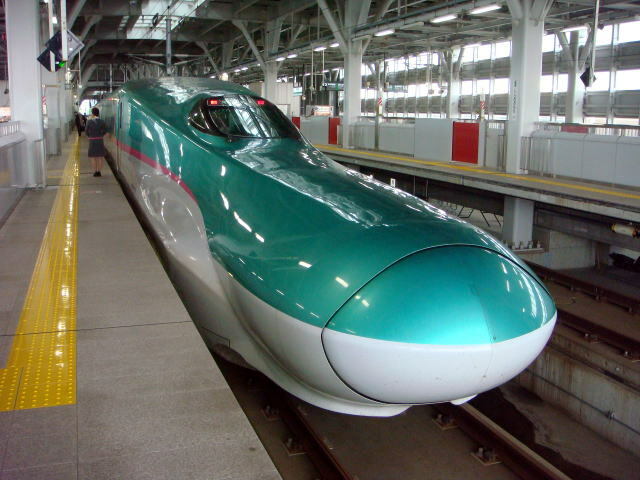 (L) Smoke-free Tokyo-Akita bullet train 'Super-Komachi' debuted in March 2013. 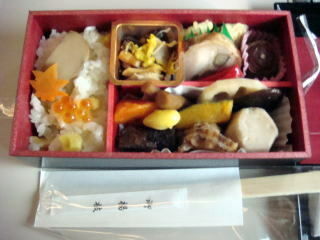 (R) Super-Komachi' is passing through Koriyama station in the twinkling of an eye. 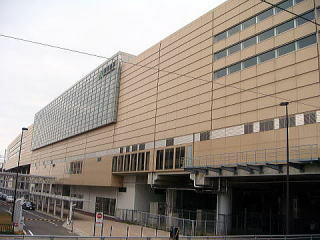 Smoking booth of Odakyu Electric Company was closed in March 2007. 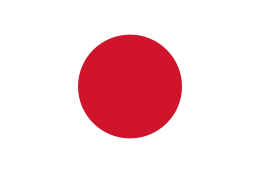 The article was written in March 2011 and last revised in October 2013, by Junhaku Miyamoto, M.D., PhD.